A type of receptor in the brain associated with attention-deficit/hyperactivity disorder (ADHD) appears to cause its effects by failing to interact with a dopamine receptor, said National Institute on Drug Abuse (NIDA) researchers. Working with mice, Sergi Ferre, M.D., Ph.D., found that the D4.7 dopamine receptor variant, unlike the D4.2 and D4.4 subtypes, could not interact with the short version of the dopamine type 2 receptor to reduce glutamate release in the striatum, the brain region associated with impulsivity and symptoms of ADHD in humans. Stimulant medications used to treat ADHD are known to be less effective in patients who carry the D4.7 variant, and the new research may explain why. 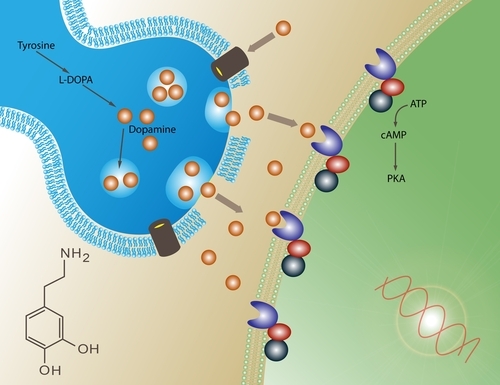 "Although previous studies have shown that dysfunctional dopamine D4 receptors are implicated in ADHD, this is the first study to show how this genetic difference might translate into functional deficits seen with this disorder,” said NIDA Director Nora Volkow, M.D. “Further research is needed to explore how this deficient interaction between receptors might be remedied, which could then lead to new medications for the treatment of ADHD." Read more about the link between genes and ADHD in Psychiatric News at http://pn.psychiatryonline.org/content/46/12/1.2.full. Information about ADHD and its treatment is also available in the pamphlet "Let's Talk Facts About Attention-Deficit/Hyperactivity Disorder (ADHD)," available from American Psychiatric Publishing at www.appi.org/SearchCenter/Pages/SearchDetail.aspx?ItemId=2433.